"Hunting Muaka? Don't. Odds are the whole time you think you are stalking it, it is stalking you — and it's a lot better at the job." Muaka are powerful, tiger-like Rahi. After Teridax caused the Great Cataclysm, many Muaka migrated to the island of Mata Nui. 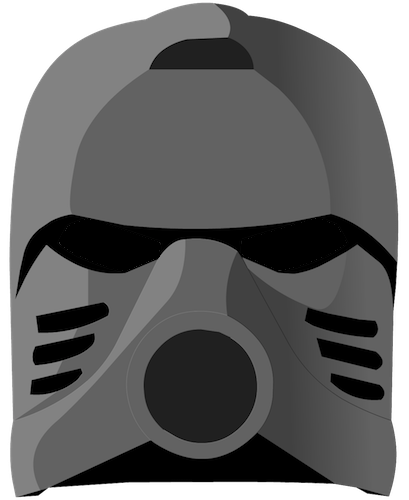 Teridax enlisted them in his Rahi army, placing them under his control through the use of Infected Kanohi. [BEU, p. 94] He would often pair his infected Muaka with infected Kane-Ra. These two creatures would not naturally coexist and thus would not work together, but Teridax liked to pair their strength together to form an elite attack force. The Muaka of Mata Nui did their best to avoid the Bohrok swarms, but eventually migrated back to Metru Nui after the Bohrok were released intentionally by the Toa Nuva. After the Great Spirit Robot was critically damaged in the Battle of Bara Magna, many Muaka left the Matoran Universe and immigrated to Spherus Magna. The Skakdi warlord Nektann has a Muaka pet with spiked armor. [DW, Ch. 3] It was mutated similarly as the spiked Muaka from the Maze of Shadows. [OGDi: Sep 5 2008, 06:08 PM][OGDi: Sep 6 2008, 05:10 PM] When Nektann led his armies into battle on Bara Magna, his Muaka accompanied them. After the battle, the Muaka likely roams free on Spherus Magna. 8538 Muaka & Kane-Ra was a boxed set released in the summer of 2001. It contained 647 pieces used to make a Muaka and a Kane-Ra. When either model's midsection was squeezed the head would jab forward as the mouth opened, then quickly closed. This was advertised as a way for the Muaka to battle with a Kane-Ra or with a Toa Mata set. The masks were attached to rods on the shoulders which when removed (as was intended to occur when a Muaka set grabbed the mask in its jaws) would cause the legs to fall off as if in injury. The set contained additional instructions to combine the parts of the two and create a Kuma-Nui.